Ropeways.net - Snow guns: TechnoAlpin beats a new record! For several years TechnoAlpin has set records in the manufacturing of snow guns! Indeed, the group exceeded the thresholds of 1000, then 2000 and up to more than 3000 fans manufactured over a year of production in 2017 and 7000 including the lances! These figures reflect the dynamism of TechnoAlpin as a leading supplier of snowmaking equipment in a sector that is experiencing sustained growth worldwide. But 2018, TechnoAlpin has reached a new threshold. Indeed, the manufacturer has exceeded the level of 110,000 snow guns produced, all technologies included (lances and fans snow guns) since the beginning of its activity! And to be precise, TechnoAlpin has even produced its 111 111th snow gun this year. This 111 111th machine had to find a particular landing point. And it is in France, on the slopes of Alpe d'Huez (Grenoble area), that this snow gun, a fan TR8 – with a special graphic design based on the summit line of Pic Blanc, the emblematic peak of the area – was set up last October. 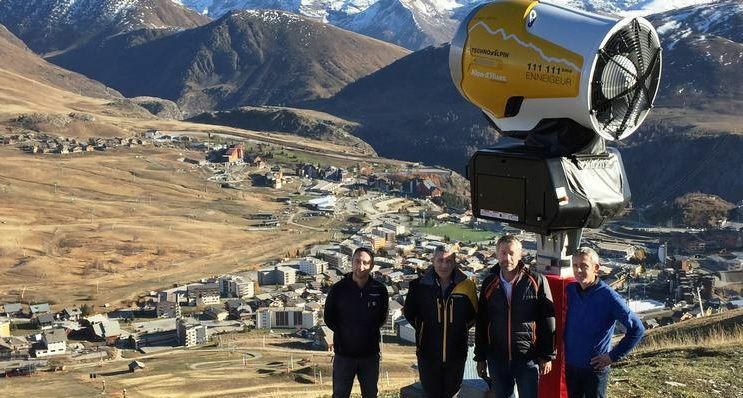 The choice of the Alpe d'Huez was quite natural for TechnoAlpin, because of the equipment strategy of the ski resort, which has opted for 2 years now for fan technology, with a first project of 70 fans TF10 in 2017 and a second project of additional 15 machines, TF10 and TR8, in 2018! For TechnoAlpin, the choice of a ski resort in France highlights the increasing popularity over the last three years of fan guns on the French market, which was historically more oriented on lance technology.